As a psychoanalytic cultural theorist, thinking about these books together ensnares me in my familiar oscillating trap: between the visceral imagery of Freud and the hygienic schemas of Lacan. Reading Freud is to vicariously feel his theories of psyche; I am seduced by this provocation of idiosyncratic feeling. Lacan, on the other hand, gives a form to these theories that does not provoke this imaginary response and instead often situates it in the impersonal schema. Essays in Feeling Photography – though not all – thrive in the realm of the idiosyncratic, drawing the reader in to their images through that singularity. If tried through Brinkema’s argument in The Forms of the Affects, they would be found guilty of flattening affects and feelings through “the premise that affects and feelings are the forgotten underside of the affective turn” (xiv). Yet while certain examples of Brinkema’s method of close reading for form are exhilarating, others push the reader away; the effervescence just isn’t there. But let me back up a bit. 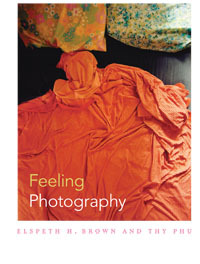 Feeling Photography, edited by Elspeth H. Brown and Thy Phu, is a lovely collection of essays that takes up the question, “What does it mean to feel photography” (2; my emphasis)? In the introduction, the editors make the case that since Victor Burgin’s assertion in Thinking Photography (1982) that theorists of photography need to distance themselves from previous interpretive methods founded in “personal thoughts and feelings,” there has been a resistance to acknowledging and theorizing feelings in relation to photography (quoted in Brown and Phu 2). The lucid and concise introduction gives an admirable overview of the tensions since the 1970s between materialist theoretical approaches advocated for by Burgin and the feeling-laden theory of photography advanced by Roland Barthes. Further, the editors formulate a genealogy of the crisscrossing paths of the art of photography with the science of affect, the debate regarding the artistic value of photography, and the example of reform photography. Tracing these paths offers new readings of the history of photography that reveal the multiple ways in which photography and feeling are connected. Indeed, the editors make the case that even when it was disavowed, feeling has never been far afield from photography. The collection itself is divided into three sections: “Touchy-Feely,” on the tactile-emotional dimensions of photography; “Intimacy and Sentiment,” on the capacity of the photographic surface to evoke these two concepts; and “Affective Archives,” which attends to the displacement of feelings from institutionalized archives and the flourishing of feeling in non-institutional sites. The sections are clearly delineated from one another, yet have a pleasing thematic and theoretical overlap as well; for example, the haptic quality of photographs is one that facilitates our intimacy with photographs, and the touch (or its absence) is visceral in the archives section. The essays approach the topic of feeling all sorts of photographs from an admirably diverse range of perspectives, including psychoanalysis, feminist theory, queer theory, critical race theory, aesthetics, and semiology. “Touchy-Feely” opens with a striking essay by Shawn Michelle Smith that juxtaposes the parallel queer theoretical projects of Roland Barthes and F. Holland Day to establish a methodology of “affective intentionality,” in Barthes’ words, a way to see photographs that does not reduce them to the reading and retains their affective power. This essay sets the tone for the collection as a whole. This method of seeing photographs is one that cuts the thread connecting signifier and signified, particularly through desire and grief, exemplified by the punctum; but Smith argues that these particular readings also provoke the “radical resurrection of the index” (44), holding both our feelings and the subject of the photograph beyond the material object. Dana Seitler’s “Making Sexuality Sensible” draws on Kantian aesthetics to think through the photographic work of Tammy Rae Carland and Catherine Opie as they create links between sensation and sexuality, as well as various periods and movements within art history. “Sepia Mutiny: Colonial Photography in and Its Others in India,” by Christopher Pinney, examines sepia toning in historical and contemporary photography as a chemical process that establishes a tactile and emotional connection, as well as a slow time (71). Through the layering of colour and warmth, these feelings of difference are mobilized in subtle ways by contemporary photographers to resist, rather than reify colonialism as their historical antecedents did. Elizabeth Abel’s “Skin, Flesh, and the Affective Wrinkles of Civil Rights Photography” queries the “seamless web of photography, activism, and visibility” (94) to consider what affects are mobilized in sit-in photographs and photographs of police brutality that move beyond outrage at the “bare truth” and instead invite the viewer into the photograph’s frame as participant. While this section is arguably the most immediate – the tactile-emotional dimension of photographs is one that anyone who has held a photograph in their hands can connect to – it is also curiously distanced, as the common threads that connect the essays are not immediately apparent. The editors provide a thorough overview of this section in the introduction to the collection, summarizing that this section helps the reader think about the photograph’s indexicality as not just about the subject of the photograph, but also about the emotional, material experience of touching/holding the photograph. This is clear enough, but it gets lost in the experience of reading the intriguing essays in “Touchy-Feely;” the collection would benefit in general from the inclusion of brief epilogues to each of the sections, to summarize and highlight salient themes, and this is especially apparent in this section. The following section, “Intimacy and Sentiment,” is the strongest in the collection and contributes powerful interpretations of vernacular photographs (identification and personal photographs), as well as professional photographs in popular media (journalistic and women’s magazine photographs). The essays in this section demand a second reading, as they are exciting to read, and at least I was keen to find myself at the end of the authors’ analyses quickly – I was not disappointed by a second reading, which revealed nuances missed the first time. Tanya Sheehan’s “Looking Pleasant, Feeling White: The Social Politics of the Photographic Smile” traces the genealogy of the now-ubiquitous smile, challenging the widely espoused view that the photographic smile emerges with new technologies that enable short exposure times. Instead, through an astonishing array of images framed through racist tropes of watermelons and smiles, Sheehan unfolds a story about the relationship between “white feelings” and “black feelings” in the United States, where the former are structured around the regulation of the latter (152-153). Lily Cho’s “Anticipating Citizenship: Chinese Head Tax Photographs” similarly takes a pervasive photographic convention (the emotionless identification photograph) and makes it dazzlingly strange through her analysis of a collection of 2,400 photographs affixed to Chinese Immigration 9 certificates in Canada from 1910-1911 (160). She argues that the intentional decision to present an emotionally neutral expression in these photographs – only two individuals in the entire collection feature smiles – anticipates a the demand for the ideal (potential) Canadian citizen to be emotionally neutral (Cho 175-176). Kimberly Juanita Brown’s “Regarding the Pain of the Other: Photography, Famine, and the Transference of Affect” is an unpacking of South African photographer Kevin Carter’s biography in relation to the subject of his Pulitzer Prize-winning photograph, a starving Sudanese child stalked by a vulture waiting for her inevitable death. Brown’s essay is a stunning ethical response to the displacement of feeling and subjectivity from the child to Carter, who came to be understood by mainstream media as victim of his own violent photographic practice (he completed suicide shortly after winning the Pulitzer Prize), erasing the subjectivity of the dying girl. And finally, Marlis Schweitzer explores photographs of ballroom dancer Irene Castle, particularly those by Ira L. Hill from 1913-1915, to argue that these photographs established new modalities of feeling as modern in her “Accessible Feelings, Modern Looks: Irene Castle, Ira L. Hill, and Broadway’s Affective Economy.” This essay examines a fascinating precursor to modern celebrity culture by exploring how the circulation of photographs of Castle established a new, modern femininity that was marked by the audience’s ability to form affective identifications with her. “Affective Archives” destabilizes Foucauldian approaches to archives as loci of knowledge production, which the editors characterize as “dispassionate” (Brown and Phu 19), and shift instead toward Derridean analyses of the affective dimensions of archives as sites of absence, desire, forgetting, and difference. Such an approach also locates the archive as something that is not solely institutional, but queer and singular. Diana Taylor’s “Trauma in the Archive” unfolds the notion of the traumatic archive as performative through the work of Pedro Matta, a survivor and tour guide at the Villa Grimaldi torture and extermination camp near Santiago de Chile. Taylor’s writing is superb, giving the reader a sense of the embodied experience of being with Matta in his archive, on a tour structured like trauma that holds the potential to “activate a powerful reaction” in the visitor to move out of the trauma into action (250). Marianne Hirsch and Leo Spitzer analyze the re-use of institutional photographs by artists Christian Boltanski and Marcelo Brodsky as archives of loss and attachment (respectively) in “School Photos and their Afterlives.” In “Photographing Objects as Queer Archival Practice,” Ann Cvetkovich weaves a lovely argument about the intimate affiliation of photography with archives and feelings. She argues that the work of Tammy Rae Carland and Zoe Leonard challenges the concept of the archive, transforming it into a queer and ephemeral art practice. Lisa Cartwright’s “Topographies of Feeling: On Catherine Opie’s American Football Landscapes” is a very strong essay in this section. In it, Cartwright focuses on Opie’s landscape and topographic photographs as evocative of the curious intermingling of pride and pleasure with the violence done to young men’s bodies transitioning into adult masculinity, even more so than the portraits of bodies that are also a part of High School Football (2007). Finally, David L. Eng’s chapter “The Feeling of Photography, the Feeling of Kinship” is an appropriate final essay before the book’s epilogue, examining how intergenerational trauma – repressed within the institutional archive – erupts in transformative archival and historical practices like Rea Tajiri’s “documentary of affect” (325). The Forms of the Affects addresses a parallel yet quite different set of circumstances to those grappled with in Feeling Photography. Eugenie Brinkema’s fearless monograph situates itself within an epistemological moment of a “meta-turn” toward affect; that is, a turning towards the turn to affect (xi). The book opens with a series of ten premises, several of which are disruptive in the best way, revealing as repetitious and paradoxical the formula for theoretical examinations of affect as singularly conceived of as movement, intensity or force (xiii). Asserting that turning toward affect must not be conceived of as turning away from language and reading, Brinkema makes the case in these early pages that the way to divert the cyclic calls of “We urgently have to attend to X!” (answered with a conceptualization of affect that is general, vague, and dull, based in the subjectivity of the individual theorist) is to engage in the specifics through close reading (xiii). In the preface, Brinkema situates the abandonment of form – characterized in Lone Bertelsen’s and Andrew Murphie’s statement that “affect is not form”(xiii) – as premised on a misleading binary whereby form is passive and rigid, and affect is active and volatile. Such a conceptualization, she asserts, impoverishes both. As noted in the epigraphs, the possibilities offered by a formal analysis of affect in particularities are washed out by a sea of vague generality, based on the subjectivity of the theorist as the analytical toolbox, and leaving much of the force of the analysis as out of language. As a corrective, Brinkema offers her readers a method for such a formal reading of affect in film. She does this through theoretical elaboration of the forms of four affects – grief, disgust, anxiety, and joy – and application of this discursive framework to closely read six films – Michael Haneke’s Funny Games (1997), Peter Greenaway’s The Cook, the Thief, His Wife, and Her Lover (1989), Chris Kentis’ Open Water (2003), and Hollis Frampton’s Zorns Lemma (1970). The most enticing part of this book is imagining how reading film for the forms of its affects might unfold for various other examples, new and familiar; the book itself reads as an invitation, not a hermetic loop. For example, one of the more thrilling analyses occurs at the beginning of the book, of Alfred Hitchock’s Psycho (1960), a film which has been read and re-read multiple times in scholarly and popular contexts. Really, Brinkema couldn’t have chosen a better example to demonstrate how her method opens up new terrain to better understand what form can do. Through a compelling reading of the tear (that may or may not be a tear) that falls from the lifeless eye of Marion Crane, Brinkema shows us a central tenet of her method. After tracing a genealogy of tears in Western thought, she makes the point that the origin point of Marion Crane’s tear is ambiguous, and we also cannot understand that tear as existing for the spectator (20). There is more to the tear than a “hermeneutic demand” (Brinkema 20) to locate meaning (truth/deceit in the tear); the tear itself is a structure that folds upon itself (Brinkema 21-22). Marion’s tear is lifeless and wholly exterior – it does not point us to her interiority, and is a textual form of “affect of self on self” (Gilles Deleuze in Brinkema 23). What this means for the theorist performing this kind of close reading is that it is critical to understand affect as belonging to no individual, as de-subjectified, and as without a body: “any individual affect [is] a self-folding exteriority that manifests in, as, and with textual form” (24-25). This method, Brinkema maintains, releases the form into the service of unrestrained readings for affect, and envisions forms themselves as affective. As noted at the beginning of this essay, the application of this method yields some breathtaking results. The form of the tear that is not a tear in Psycho is a gripping example (crying), as is anxiety’s form of the solid line that is chaotically broken (Open Water). Brinkema’s reading of the latter film as “a frame around the heavy time of waiting for a certain imminent death” (210) is completely successful in demonstrating how the affects of a film reside not in the depiction of the psychological interiority of its characters, but instead in the film’s structures. Open Water is a thriller about a couple (Susan and Daniel) on a tropical vacation, who are inadvertently abandoned in the open ocean by a scuba boat due to a counting error by a member of the crew. The film’s time is predominately spent on the couple floating in the ocean from late morning to dawn the next day, futilely hoping for rescue and visibly/invisibly surrounded by curious sharks. Both members of the couple die; a shark bites Daniel’s leg and he bleeds to death later on the day they are left at sea, and the next day at dawn Susan releases Daniel’s corpse, removes her flotation vest and allows herself to slip beneath the ocean’s surface. This film is perfect to help illustrate the effectiveness of escaping from an analysis of the characters’ psyches and into the formal elements of film in order to read for affect – Susan and Daniel are psychologically flat characters, so the temptation does not arise to probe too deeply into their words and actions. Instead, Brinkema focuses on the formal elements of the number (time stamps on the film, miscounting the number of scuba divers, an inauspicious selection of vacation dates) and of the horizontal line that separates the ocean from the air (rendered intermittent by the ruptures of the sharks and the couple, who breach the line of the visual by emerging above or dipping below); both of these are utterly indifferent to the existence of Susan and Daniel. The cinematic staging of Susan and Daniel’s abandonment is a “drowning of form,” according to Brinkema, where anxiety’s structure of inertia and intermittency – a nothingness – is made apparent (209). The form of the film is a space where nothing happens in time but the breach of the line, and where the couple must disappear beneath the line into nothingness. I cannot overstate the originality and comprehensiveness of the theoretical elaborations of grief, disgust, and anxiety in particular; each draws out new insights from well-read texts that are challenging to arguments that reappear in studies of affect. Brinkema’s analysis of grief in relation to the formal properties of light is particularly striking. The productive and generative capacities of loss are often held alongside more devastating consequences in memory and trauma studies. Drawing on Freud’s theory of the distinction between mourning and melancholia – where mourning is the normal “working through” of the lost object, and melancholia is the painful and pathological experience of loss without an object – the latter comes to be positioned in contemporary theory as a valorized locus of creativity and movement. But Brinkema shows us how Freud’s distinction was not so clear to Freud himself, and that the blurring together of mourning and melancholia in his writing (becoming what she calls “mournincholia”) has had ongoing consequences (66). Likewise, grief and mourning have been distinguished from one another in contemporary thought – grief as an interior, and mourning as an exterior, expression of loss – yet at the same time used as synonyms. Brinekma argues that the way out of these binaries and conflations is through a close examination of light and illumination; that cloudy grief is passive, undialectic, and unresolvable, an event separate from the clearing of mourning (as a more active and attentive event), and that photography is a medium capable of holding grief. Building on Joan Didion’s sentence that the movement from grief to mourning is to “let them [the dead] become the photograph on the table,” Brinkema explains that the capture of a moment of light in the photograph figures grief as painful and unresolvable, and the photograph is a space of holding the irresolvable and receiving the finitude of loss (75). Understanding grief through photography as “a problem of the transmission and capture and staging of light” (75), Brinkema reads a scene of still luminosity in Haneke’s Funny Games as the cinematic staging of grief as heavy, non-transformative, and undialectical in the following chapter. Funny Games is a horror film about a bourgeois family (mother, father, son, and dog) at their country home who are taken hostage by two sadistic men who torture them through physical as well as psychological violence. By the end of the film, all members of the family (canine and human) are dead. Brinkema’s discussion of the form of parental grief focuses on a ten minute long tableau scene after the son has been murdered. However, unlike the previous reading of the tear in Psycho, and the subsequent reading of the line in Open Water, the intriguing analysis of light in the slippage between the concepts of mourning, melancholia, and eventually grief builds up to something that isn’t quite delivered in the reading of Funny Games. While Brinkema carefully explains that the film is structured as parental grief is (a very convincing analysis), the significance of light often disappears in the shadow of other formal elements like the pose, the tableau, and photographic staging. Elspeth H. Brown and Thy Phu’s Feeling Photography is an exciting contribution to the field of photography theory, and exists within a recent tide of scholarship focusing on the nexus of photography and affect; for example, the work of Sharon Sliwinski and Elizabeth Edwards, as well as the special issue of Photography and Culture edited by Thy Phu and Linda Steer. This collection will be of interest to a very wide range of scholars in the humanities, and not just those that study photography – the book offers a range of ways to think about the function of photography as it often exists unanalyzed at the margins of a variety of social and cultural phenomena. Potential readers will be pleased to know that it contains 16 pages of colour plates; however, the selection of photographs was a bit puzzling, as there is an overrepresentation of certain artists (Catherine Opie, Tammy Rae Carland) and an absence of photographs that would be valuable to see in colour in the book (for example, the photographs of Marco Brodsky as well as Kevin Carter’s photograph have a different affective force when in colour). The diversity represented in the objects of study, theoretical approaches, and styles of writing make this collection a very good possible course text for a graduate course especially, but also for an upper-year undergraduate course on photography. 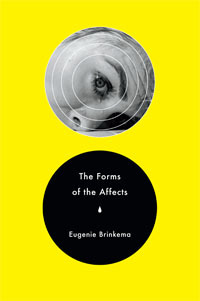 Likewise, Eugenie Brinkema’s The Forms of the Affects is an innovative book that will surely be of great interest to scholars of affect and film studies in particular, but the possibilities for her method will also be useful to those in visual studies, literary, feminist, and queer theory, philosophy, and cultural studies more broadly. This is not a book for a general audience, but rather a specialized audience from the graduate level onwards. The book has a generative ebb and flow, in the terms of its liquid structure: Brinkema empties her affects of their familiar meaning through impressive theoretical work, and then through close reading lets the new understanding fill in the forms of the affects in her chosen films. I was amazed at Brinkema’s modest selection of images that are impeccable for capturing the forms of the affects in the films discussed. The book is beautifully designed; I would be remiss if I did not mention at last the transitional spaces of interlude near the beginning and end of the book that offer connections and divergences between its themes and chapters, as well as the negative space created by introductory passages before each affect. These books will be of great interest to an intersecting and wide range of audiences studying and teaching affect theory. Psycho and Open Water in particular. Dr. Rachel Alpha Johnston Hurst is an Associate Professor of Women’s and Gender Studies at St. Francis Xavier University in Antigonish, Nova Scotia. Her research is broadly concerned with the relationships between embodiment, (visual) culture, and power, through the perspectives of psychoanalytic theory and decolonial thought. She is the author of Surface Imaginations: Cosmetic Surgery, Photography and Skin (McGill-Queen’s University Press, 2015) and co-editor of Skin, Culture, and Psychoanalysis (Palgrave, 2013; with Sheila L. Cavanagh and Angela Failler).